It was the sleeves that sold me on this sweater. And I am NOT a ruffles gal - but these seemed unique but not too girly. Also, the color was quite neutral and helped balance out the femininity of the sleeve shape. The only drawback to the sweater is that it sheds like crazy!! Thankfully, Stan keeps a lint roller in the car so I was able to salvage my black jeans before we took these photos. However, the coziness (and price point) was too good to pass up! 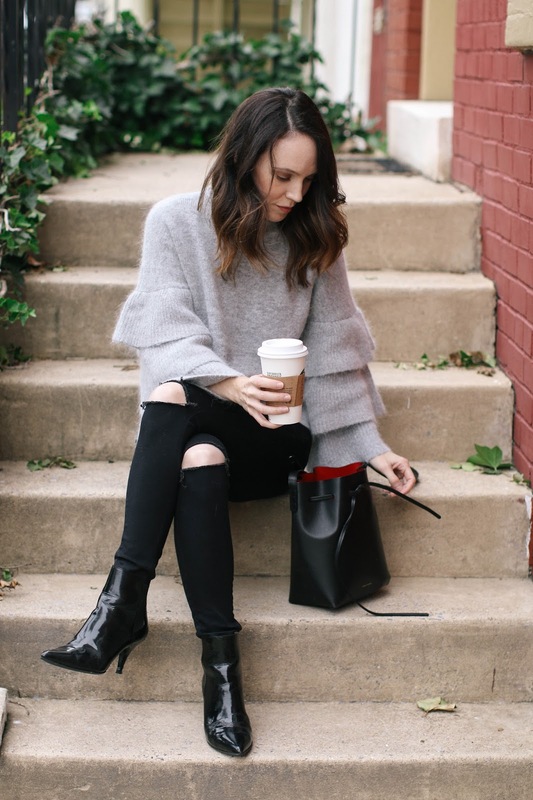 Since the sweater had a looser and exaggerated fit, pairing it with my skinniest jeans created a better silhouette. And no fall pictures are complete without a Starbuck's accessory, amiright? #typicalblogger Maybe it's just me, but I always end up taking pictures with coffee in my hand in the colder months because it helps keep me warm while shooting. Perhaps some bloggers really enjoy using them as props, but mine is because I am always cold. Ha! On the beauty front - I just picked up this highlighter. I wear the heck of the bronzer from the brand I picked up this summer so I was sucked in to this new one. I also grabbed the new foundation and will be reviewing soon. I don't typically gravitate towards La Mer on a regular basis, but these two makeup products really piqued my interest. Our bed arrives tomorrow and I couldn't be more excited! I still have more pieces to buy for the bedroom to complete it, but a good portion of it will be done after this delivery. I will be sure to share the final look on the blog. In the meantime, follow me on Pinterest to see other home pieces I am pinning (and fashion, and beauty and tons of fall foliage pics LOL). Oh my god that top is amazing. You look wonderful! I love that sweater! It looks so cozy! That jumper is THE perfect jumper. I don't just want it, I NEED it!